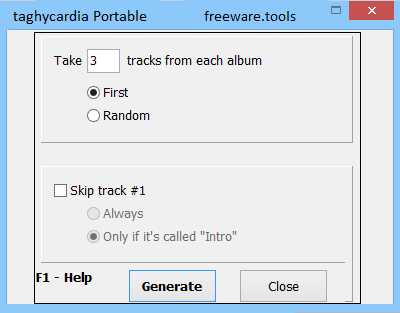 This is the portable edition of taghycardia, a simple-to-use Windows application that enables you to automatically complete tag information for MP3 audio tracks. You can automatically normalize MP3 tag information across multiple audio tracks at the same time as well as configure advanced settings. It features auto discovery and correction of missing tags, Artist/Album inconsistencies, and track numbering errors, all in order to prevent the "decomposition" of your MP3 albums on a tag-sorting portable player, auto fill in missing Artist, Album, Year, and tracknames with the integrated Discogs.com database search and a lot more. Since there is no installation involved, you can extract the program files to any part of the disk and just click the executable to run. There is also the possibility to save taghycardia to a USB flash disk or similar storage unit, in order to run it on any PC effortlessly and without previous installers. Worth mentioning is that taghycardia does not alter Windows registry settings or create extra files on the HDD without permission, thus leaving no traces behind after its removal. At startup, you can select how to use the program. It is possible to ensure the accessibility of downloaded MP3 albums on iPod and iPhone devices, for general MP3 auto tagging, to download cover art automatically, or to remove it for recover space on the disk. In the next stage it is necessary to drop a folder filled with MP3 tracks in the main window. There are many kinds of settings which can be tweaked. For example, it is possible to rename playlists, add track numbers to the file names if they don't already exist, as well as integrate taghycardia into the Windows Explorer context menu to quickly process files. taghycardia does not hang, crash or pop up error messages. It has a good response time and carries out tasks rapidly while remaining light on the the system resources. Less experienced users may have a difficult time learning what all settings stand for. Nevertheless, taghycardia serves its purpose when it comes to normalizing MP3 tags in batch mode.